We arrive in the crazy city that is Ica. Taxi’s drive like they’ve been stolen and there are multi-coloured tuk tuks all over the place like colourful ants. Ica, with its flat buildings and wide, packed streets is surrounded by desert in every direction, but just a short 5min taxi ride from the city center lays the little gem of Huacachina. 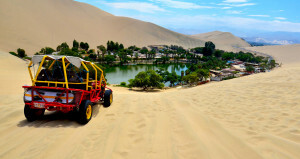 It is an oasis surrounded by massive sand dunes on all sides, the lake of Huacachina in the middle dotted with palm trees all around and restaurants and bars in period buildings built by the Spanish a hundred years ago. We book into Casa de Arena Hotel, which is definitely a party place. With a pool and numerous bars and a hundred young American and British travelers swarming the place, what else would you expect? On our travels for the last few months we have met many travelers and there are definitive categories that they can be grouped into. I’m not a big supporter of labels or forcing others in to little boxes but sometimes it does make sense. I’ve found that young Brits and Americans, and Australians to an extent, are really just on a party trip. Their dollars and pounds make everything on the South American continent very cheap to them, and it’s more about the parties than the cultural immersion for most. They tend to stick together, very rarely even attempting to converse with locals, and will loudly complain about lack of luxuries, as if it wasn’t their choice to travel to rural South American countries. With Casa de Arena turning into a massive nightclub on a Friday night it is not really our vibe, but this is where we find ourselves, mostly due to the fact that they have a very good deal on dune buggy and sandboarding excursions. For 40 soles per person we book a sunset trip for the following day. We find a quaint local eatery filled with middle aged Peruvian men drinking beer and watching a talent search game show, where we eat a pizza. Not bad. The touristy restaurants at the far side of the lake are way overpriced, and it is safe to say that you will save a few bucks on food if you eat where mostly locals eat. Tummies full we take a walk around the lake in search of the mythical mermaid. 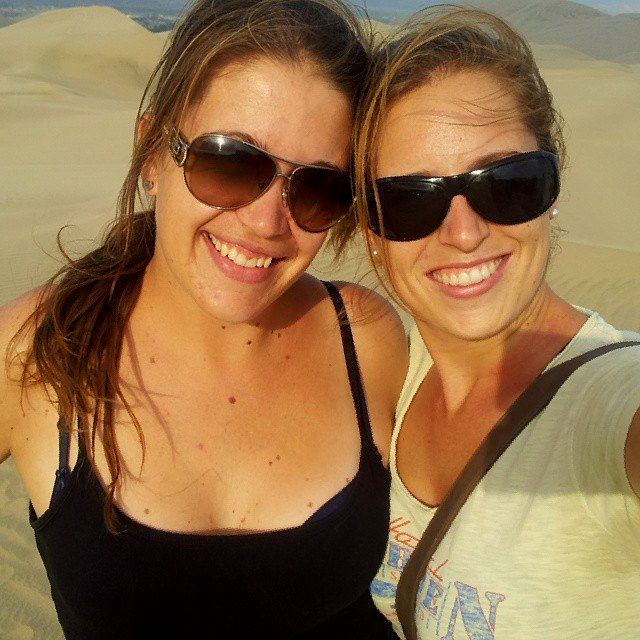 We don’t find her..so we head off to bed excited for our first sandboarding experience tomorrow. After an eventful night that involved a slight earthquake or two, we awake to find that Casa de Arena has a decent breakfast selection – for a price of course. Scrambled eggs, bread, tea, coffee, pancakes, fruit salad and also a traditional Peruvian breakfast of baked eggs with a spicy chilli-ish sauce is more than enough to satisfy our hunger and set us up for the rest of the day. We take a relaxing walk on the dunes around the lagoon oasis and contemplate more reasons to explain why people in South America love to litter so much. Our conclusion – more developed nations brought the evil of plastic over when those who already lived here were happy with wrapping their food in leaves and drinking from coconuts or natural ceramics. Now they were used to just throw their leaves and ceramics in the bush after use because it became one with the earth again. But that doesn’t happen when you throw plastic wrapping in the bush, now does it..? It could be that we notice it more while we travel because we walk most of the time, whereas we are safely guarded in our cars back home where the real world is at a safe distance on the “outside”.. Just dispose of litter in the bins that are provided! Not that hard! Stop being so careless and utterly lazy! It’s 3:30pm and we get ready for our dune buggy and sand boarding adventure. Before heading up to the dunes each person (8 excluding our driver) pays 3,80 nuevo soles desert tax. They love taxing everything here. We are sitting right in the front. I’m in the middle between the driver and T, right behind the roaring engine. I can feel the extra heat from the engine brush over my face, and I have a hard time repelling the image of the engine exploding and engulfing me in flames from my mind. In no time we are off on what I can only describe as the most exhilarating ride EVER! 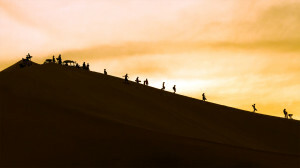 We are the lucky ones who get to experience the very first taste of the ups and massive downs of these huge sand dunes. This is what I always imagined real desert to be like. Sand as far as the eye can see, like the deserts in fictional Arabia. 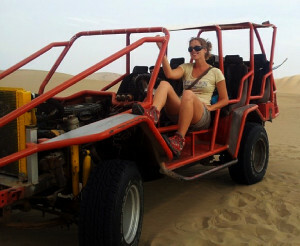 We hop over the edges of down 160 degree dunes where the buggy actually lifts off the sand and we are flying! This is better than the best roller coaster ride I have ever been on. We make it to the very top of a group of dunes and I am once again amazed by the natural beauty around me. Nothing but the softest, golden sand in every direction; sunlight encapsulated in the tiniest grains of sand. Now, we sand board! They’re very smart by starting you out on a little dune on your bum to get the feel of movement on sand. I climb back up and try, semi-successfully, to go down on my feet. The next dune is a bit bigger, and the next even BIGGER. You’ve never seen a bunch of adults, varying in ages from 24 to 55, play happy as children in the sand like this. We are all feeling comfortable now and go down the bigger dunes on our stomachs, and it feels like flying! The 6th and last dune is so huge that those who are waiting at the bottom are tiny as ants. I go for it on my tummy, flying faster than ever before. The most fun EVER! Everything is full of sand, even inside my socks! One last buggy ride and we head back to the hotel. What a thrilling adventure! On to the next one – Lima, here we come! This entry was posted in Peru, Travel and tagged adventure, arena, boarding, buggy, casa, de, desert, dune, dunebuggy, earthquake, Oasis, sand, sandboarding, water.